Looking to give your lampshades a new look for the holidays or the winter season? 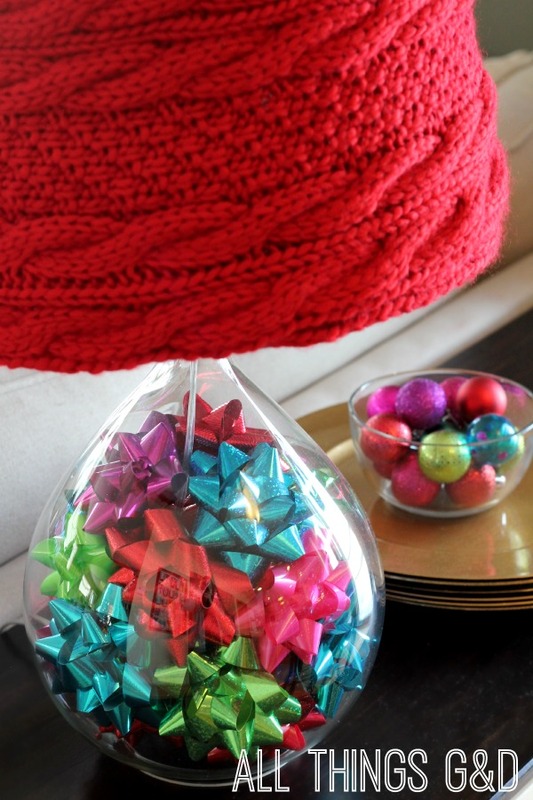 Try my easy, no-sew idea to cover and cozy them up using a scarf! A “before” look at the lamps and shades. 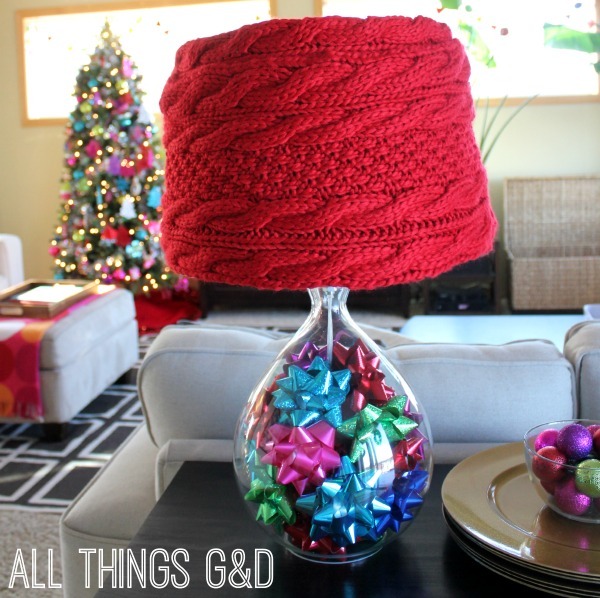 I wanted to cover the shades with something warm and cozy, and I love the look of my friend Beth’s DIY Sweater Lampshade Tutorial, but I was interested in something temporary that I could easily remove after the holidays without doing any damage to my shades. While browsing Old Navy one afternoon I spotted these chunky cable-knit scarves in the perfect shade of red and knew I had to make them work somehow. 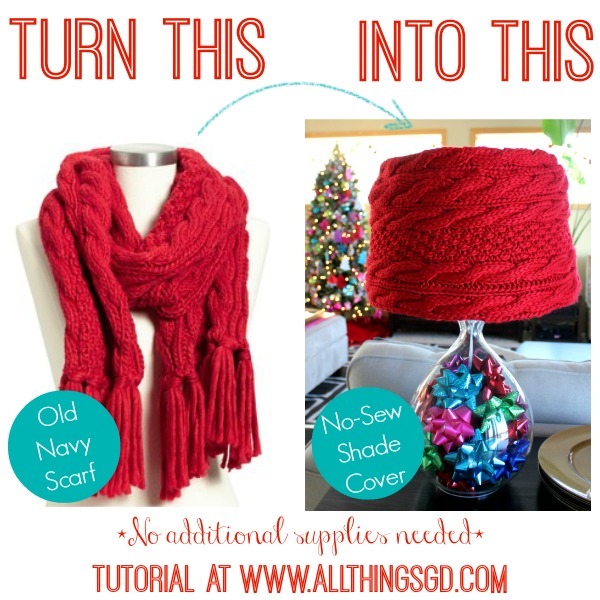 After a few different attempts I found an easy way to make it work without damaging the shade or those gorgeous scarves! 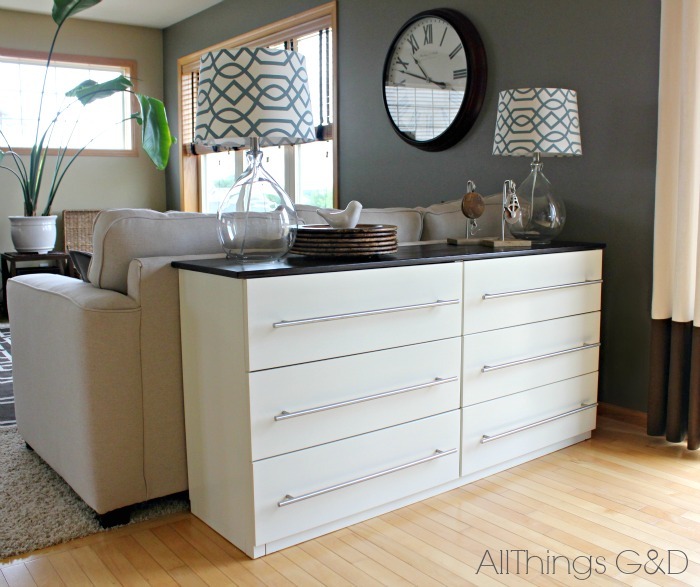 I’m a visual person so I took pictures of each step, but don’t let all these photos scare you – this is a super easy DIY project. If you can tie a knot you can do this! 1. 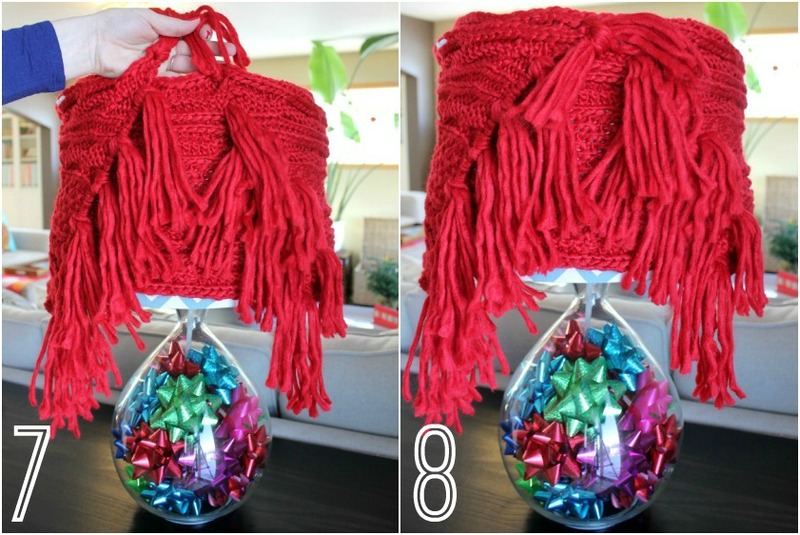 Wrap scarf one time around lampshade, pulling it snug so it doesn’t shift or slide down. 3. 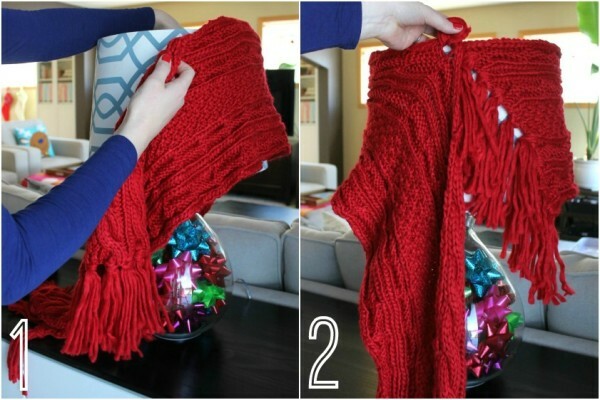 Make an opening through the cable-knit where it meets the 2nd tassel, and pull the 2nd tassel through. 4. 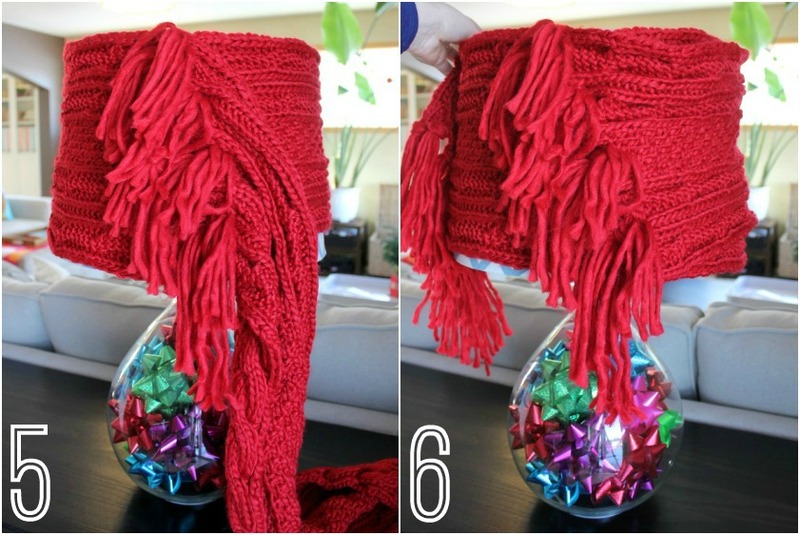 Tie the 1st and 2nd tassel together to hold your scarf in place. 5. 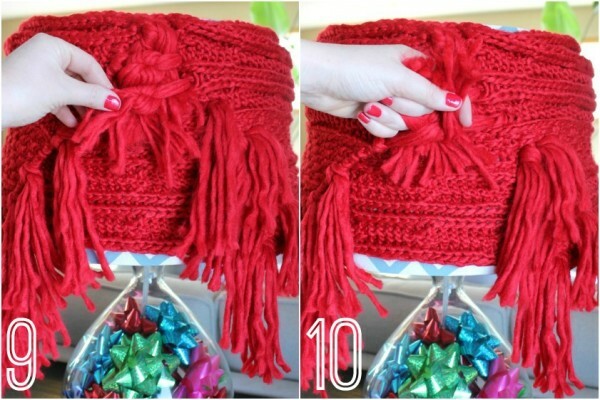 Continue pulling tassels through the cable-knit, working your way down the entire length of the scarf, and knotting every 2 tassels together to hold them in place. 6. When all the tassels are pulled through, wrap the remainder of the scarf around the lampshade. 7. Untie the top 2 tassels on the right that you previously knotted in Step 4. 8. 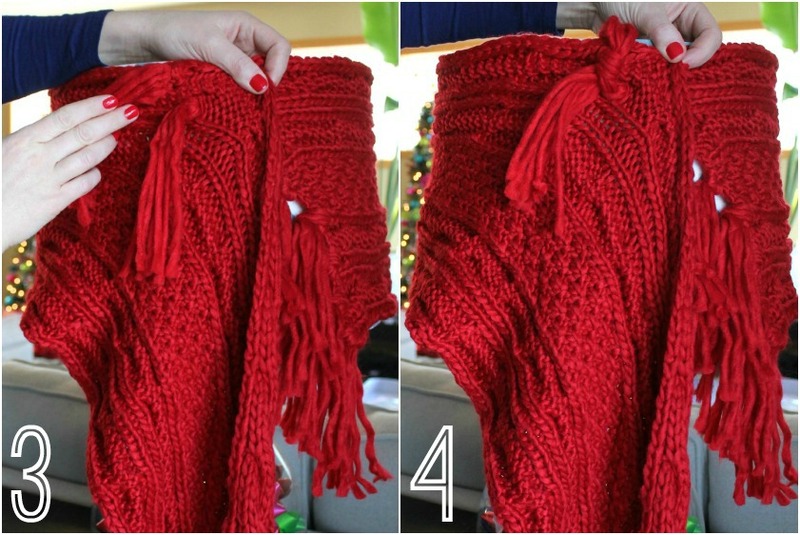 Now you will knot the top tassel on the right with the top tassel on the left (the other end of the scarf that you just wrapped around). 9. Continue untying the previously knotted tassels on the right, re-tying each one with its match on the left. 10. Keep the tails of your knots tucked down so they are covered by the next knot below it. 11. Continue knotting tassels, working your way all the way down the lamp shade. 12. 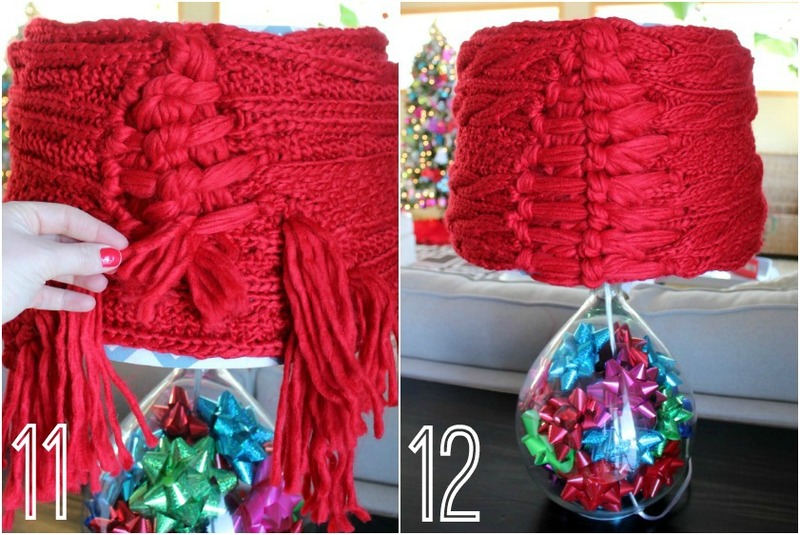 Tuck the final knot’s tails up to hide them, turn the lampshade so your knotty work is in a less visible spot, and you’re done! 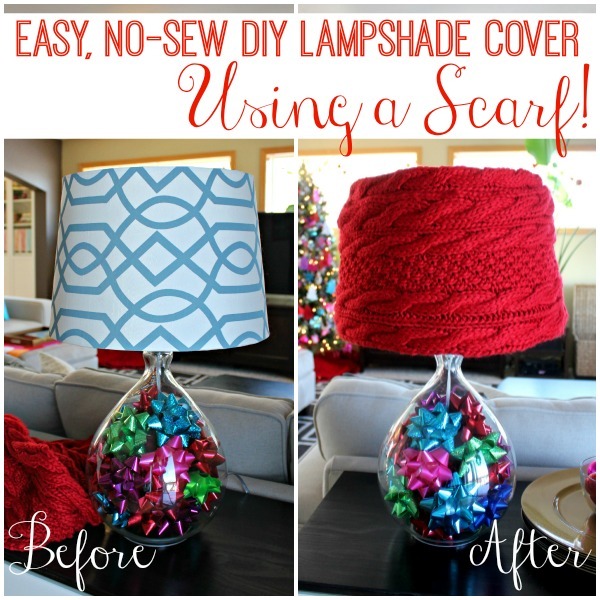 An easy, no-sew, DIY lampshade cover made using a scarf – no additional supplies necessary! 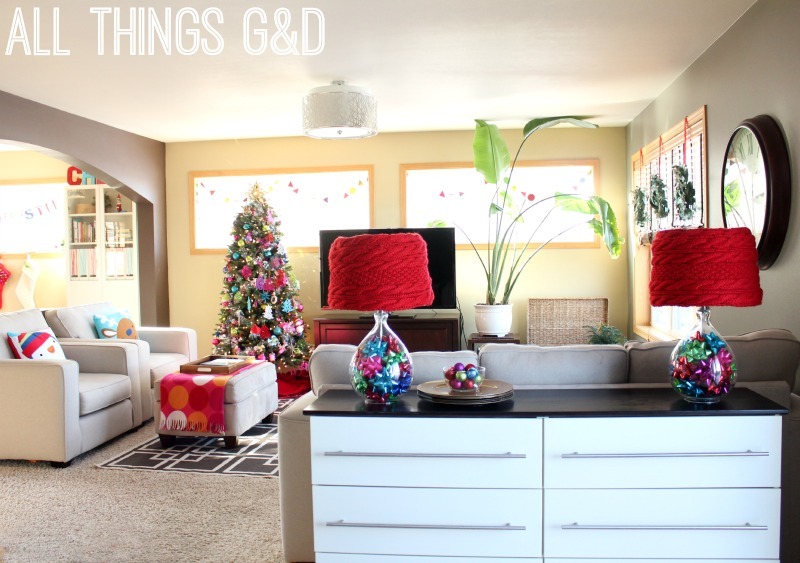 A look into our living room. 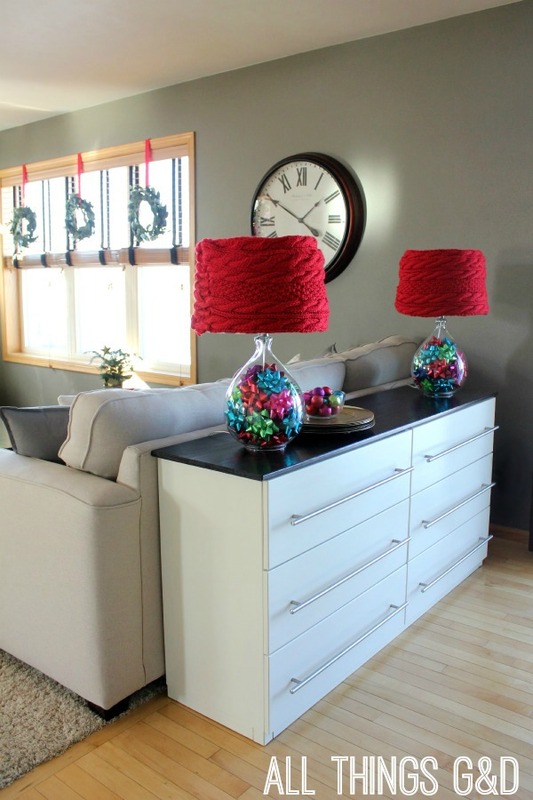 IKEA Tarva dresser transformed into a kitchen sideboard and all decked out for Christmas! 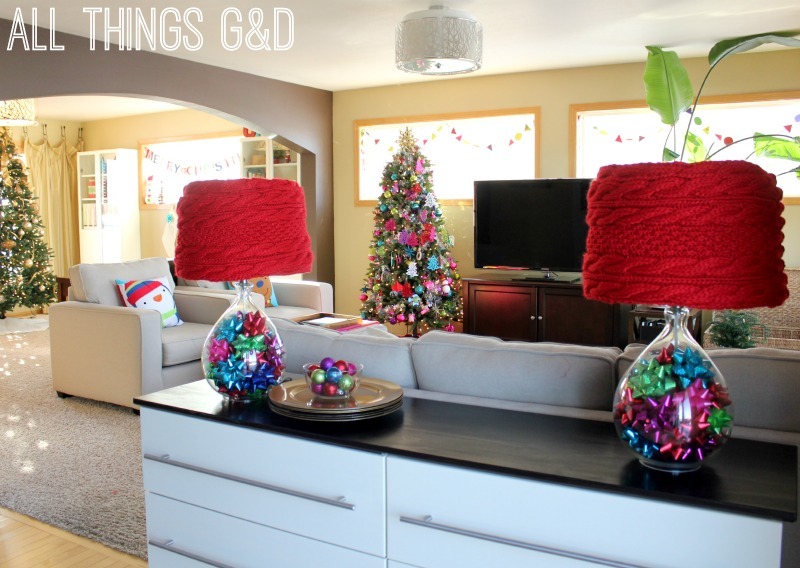 Gift bows added to the glass lamp bases bring even more pops of color in! There’s typically a kitchen table in front of the sideboard but I moved it out of the way to get the living room shots and didn’t move it back before taking this one. A bit of a fail, but I wanted to share it anyway because it catches Kate’s Christmas Countdown Advent Calendar! 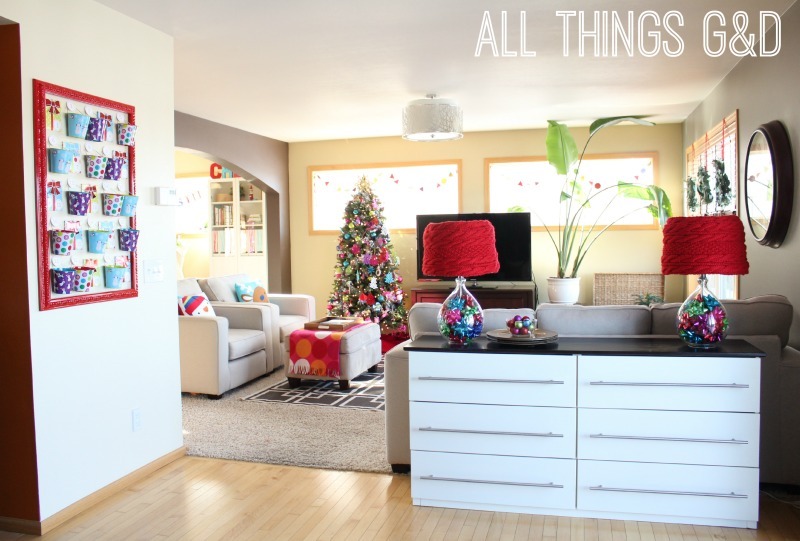 Stay tuned for my 2013 Holiday Home Tour, coming tomorrow! I love this tutorial! We are renters so I’m always looking for fun ways to decorate without losing our security deposit & this fits the bill!! Also let me know if you need my address to send me one of those fabulous scarves once the holidays are over ;). Thank you so much, Delnott! Also happy to know you’re willing and able to take a scarf off my hands if needed, haha! What a clever idea. I love how you wove the ends together. Thank you so much, jbhat!